It has been existent since long. Even today most homes in the US fulfill their hating needs with a furnace. 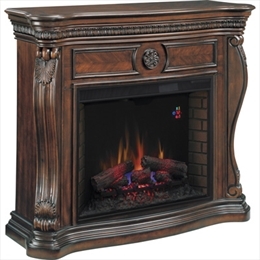 Furnaces can be of various types – gas and oil fired furnaces and electric furnaces. In the fuel-fired furnaces the fuel is released with the opening of the valve. It reaches the burner and then is ignited. The fire produces heat which is sent to the heat exchanger. The exchanger heats the air which is then circulated in the house through blowers, ducts, and registers. This type of heating system is called a duct ed warm-air or forced warm-air distribution system. The exhaust air goes out with chimney. A furnace on an average can result in some amount of energy loss of 30 %. At its best it can reach an efficiency level of 90 to 95%. This is true of condensing furnaces. They reclaim the exhaust gases without letting it vent out through the flue. It sends it to the second heat exchanger and gets it condensed. The heat released as a result of the condensation is used to warm the house. The low pressure gas and the condensate are typically vented through a sidewall with a plastic pipe. The heating levels of forced air furnace are controlled by a single thermostat. Furnaces are also fired by electricity. These are electric furnaces. In this coils are heated with electricity that produces heat that is used to cool the air. They are more efficient than fuel furnaces. Their chief demerit is that prices of power are increasing every day. Boilers are used to produce hot water. The hot water is circulated through the tubes and pipes and embedded in the floors that rises up from the tubing and warms the rooms. This is called hydronic heating. You will rarely see steam boilers today, but once they were used rampantly. In this the water is boiled and the steam carries heat through the house, condensing to water in the radiators as it cools. Oil and natural gas are usually used to operate steam boilers. You can have zone thermostats for boiler systems that can control the temperature of individual rooms. Heat pumps are devices that can carry out both heating and cooling by moving heat. Thy draw heat from the external environment and use it to heat the buildings. Thy have two units-one outside the house and the other inside the house. The outdoor unit draws heat from the air through coil filled with refrigerant. The compressor compresses the refrigerant and sends it to the other coil inside. Here the refrigerant condenses releasing heat which is used to heat the house. A geothermal heat pump draws heat from the ground instead of the air. They are rare than their air source counterparts and are more efficient. They are quite expensive to install but tax credits are available by the federal government to enable consumers install them. They are generally installed in houses which are permanent residence of their owner. These units cannot be ported, if you plan to move to another place. The ground source heat pump also has an indoor unit. At the outdoors the pipes dug into the ground or water sources. These have refrigerant solution running in them which absorbs the heat and brings it to the indoor unit. There are various configurations of geo thermal heat pumps. You select one of them according to soil type, availability of space, water sources etc. An air source heat pumps can produce almost three times the energy, it consumes in form of electric powers. The efficiency of ground source heat pump can reach up to 400% or more. The efficiency of heat pumps is measured in COP. The direct heat space heaters do not need a duct work to heat spaces. As they are not connected to ducts, they cannot heat an entire house. They are meant for single rooms. They are compact units that can be mounted on walls or can be standalone units. . If you have to warm more than one room through these, you should keep the doors open between them to allow the heat to pass Their AFUE (Annual Fuel Utilization Energy) is typically between 60 and 75%. There are newer models with sealed combustion chamber. They vent the combustion gases to the outdoors and draws air from the outside to feed the combustion through a dedicated pipe. They are sealed direct-vent units. These have an AFUE of 100%. Gas-fired heaters are run with natural gas or propane, and some burn kerosene. Some gas-fired heaters are manufactured without vents. This is because their manufacturers claim that the products’ combustion efficiency is very high. These are a very cost-effective source for heating homes. The stoves can be fulled by sawdust, wood chips, bark, agricultural crop waste, waste paper, and other organic materials. 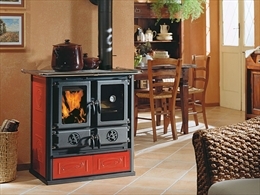 Buying and operating wood stoves are cheaper than furnaces but burning wood is not eco-friendly. Wood pellet stoves burn wood pellets. These can save you 40 to 60% on your heating cost. Wood pellets which are compressed sawdust are an easily available fuel in all regions of North America. They are economic than furnaces and burns cleanly. These heaters are hard wired to your electric system. They have fans that blow the air across the heating element inside the heater. The warmed air circulates into the room, raising the ambient temperature. They are a bit nosy due to the fan. Radiant heaters come in many forms. Those powered by electricity are installed in the floor or high on the wall or in the ceiling as radiant panels. Radiant heaters in concrete floors work best as concrete absorbs heat well and can keep a room warm for several hours. Radiant panels in ceiling are also good but they would heat things better that are directly underneath them. In big houses, electric base board heaters are used as secondary sources of heating a house where a central heating system is used as primary source. They can effectively heat small spaces such as cabins, basements, etc. They are installed at a few inches from the wall and floor. They are covered with wooded blocks. They are hard-wired with an electric line and works on the principle of radiant heating. Baseboard heaters have absolutely noiseless operation. 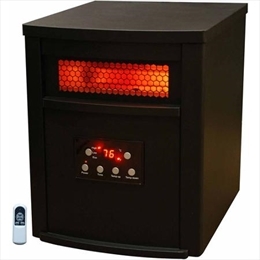 Electric space heaters are all small heating units powered by electricity that are not hardwired to the house’s electrical line. They are plugged to an electric socket for operation. You can port them from room to room. However there is one flip side. As these aren’t secured to the wall, they can cause a fire hazard if tipped over.